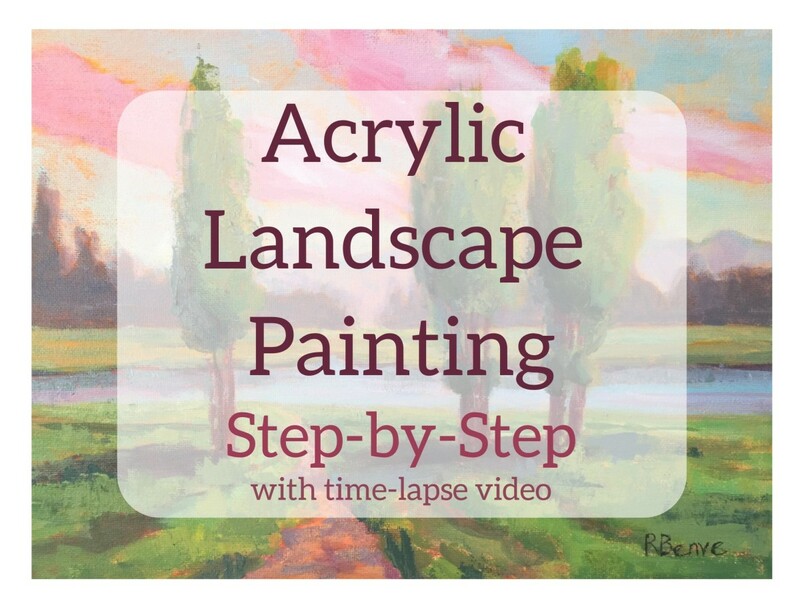 When you paint a landscape, you are very likely to have one or several trees in the scene. Though we see them every single day, and we are very familiar with their shapes and colors, painting trees convincingly is actually quite hard. Keep reading to see how to find a solution to all of those problems. Even when the trees are all of the same species, each one has a slightly different structure; it’s almost like they all had different personalities. If you observe intently, you can find the pattern that sets each particular tree apart from the others. Getting the shapes of the various parts of a tree correctly is essential to the believability of the scene. The best conditions for being able to render the character and volume of a tree, is painting when the light is coming in from the left or the right, forming a lot of shadows within the tree and some nice elongated cast shadows on the ground. If the tree is lit straight on, either from behind you, the viewer or from the top, like at noon, there isn’t much shadow to help define the light and the dark areas. If the tree is back-lit, all you see is a dark silhouette, not many variations in tone and color. 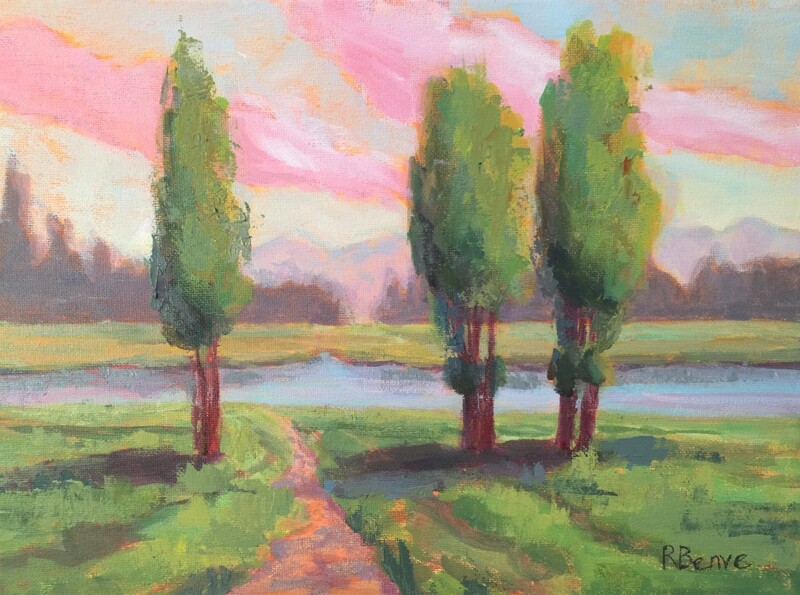 Try to paint trees in the early morning or late evening to take advantage of the light and shadow patterns. Is it hard to paint believable trees? Starting with the most important feature of the tree, its contour, and ending with a few details, here are the nine steps to painting trees that are believable and that present character and dimension. 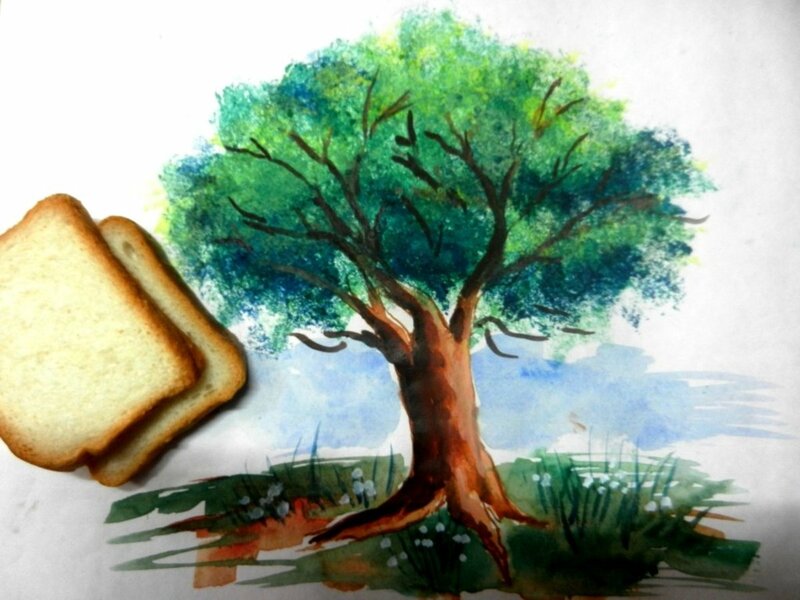 Observe the tree that you are going to paint and find the elements that set it apart from the others. The trunk and branches are essential for the structure of the tree. Observe carefully. Are they relatively straight? Do they tend to grow upright? Or at angles? Are there big gaps between branches? Is there some kind of symmetry? Understanding the structure of the branches can make painting the leaves easier. Don’t forget that some of the branches are not shooting sideways, but they are coming towards you, and they may be visible if the foliage is bare. These branches may be the most difficult to render because they are foreshortened and in perspective, but comparing length and angles of the segments, you can get them right. 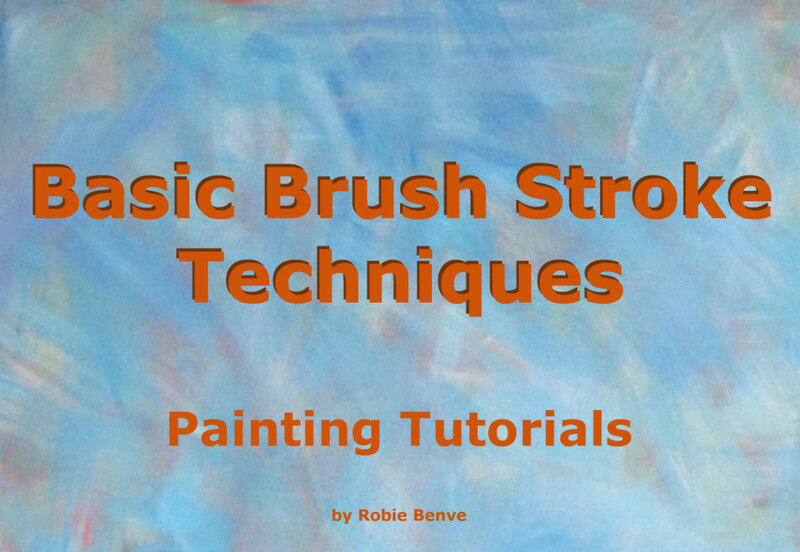 Draw them with smooth, free-form strokes of thin paint. Avoid using brown. Observe the trunk and find a hue from the color wheel that is the closest to that color. Many times, trunks are a very dull green, red, violet, or blue. Brown is not a hue on the color wheel, but it can be a dark, dull red or orange. The outline of the tree is very important for establishing both its species and its unique character. Don’t worry about the details, simplify as much as you can. The overall shape of the tree can be very convoluted, and the single leaves and small branches can make it very intricate. Simplify it, but make sure you keep some of the unique curves and indentations that are unique to that particular tree. First, observe all the large shapes that make the outline of the tree, then draw them out. You may want to draw with pencil or charcoal before you start applying paint. Once you become more confident, you can draw the outline directly on the canvas using very thin paint. I like to use a contrasting color, like red or orange. If you don’t feel confident with this step yet, practice on paper until you are confident and then you can draw on your support. To be able to see simplified shapes, squint. Squinting simplifies shapes by eliminating details, softening color contrasts, and flattening forms. Vary your greens, keep them interesting, and avoid garish, fake colors, unless absolutely necessary, like on very intense highlights. Add some red or orange to your greens to dull them and make them look more natural. Many times, a gray color, a blue, or violet can serve as “green” in some areas, adding visual interest. Don’t be afraid to experiment with your mixing. In general, greens will be warmer and lighter in sunlit areas, and darker and cooler in shaded areas. After the initial drawing, observe each cluster of leaves on the tree, pay attention to the shape of the masses and the different values (dark and light) within them. You’ll notice that, if the tree is in sunlight, the bottom of each cluster is always darker and cooler in color, and the top is lighter and warmer. The most important parts that should be painted first are the shapes of the shadows. Block them in with a nice dark, and cool paint applied thinly. Dilute oil paint with thinner, and acrylic with a little bit of water. Well-defined areas of light and shadows help identify the shape of the tree and its volume. Once you have the darker masses set in place, you can paint the lighter shape of the top leaves and create a sense a volume. Keep it simple, paint the leaves as a flat shape, with a big brush. The trunk and the branches will also have a dark and a light side. Make sure the direction, strength, and color of the light are consistent throughout the painting. With a smaller brush, add a few thick dabs of paint where appropriate to give the idea of individual leaves. There is no need to paint every single leaf. Our brains understand that it's a bigger green shape made of small parts, and fill in the information that is not painted. Too many dabs and your tree runs the risk of looking overworked and amateurish. The contour of a tree is very soft; if you paint it with hard edges, it appears pasted on the landscape. The edges of a leafy tree are made of small leaves that are facing in different directions, reflecting the light in many different ways, and even letting some of the sky showing through. In the case of bare trees, the contour is made by many thin branches that create kind of a screen with a fuzzy perimeter and calls for very soft edges in which the color of the branches and the color of the sky intermix. In general, you should avoid strong, sharp edges around the tree, but it's ok to have a few here and there. 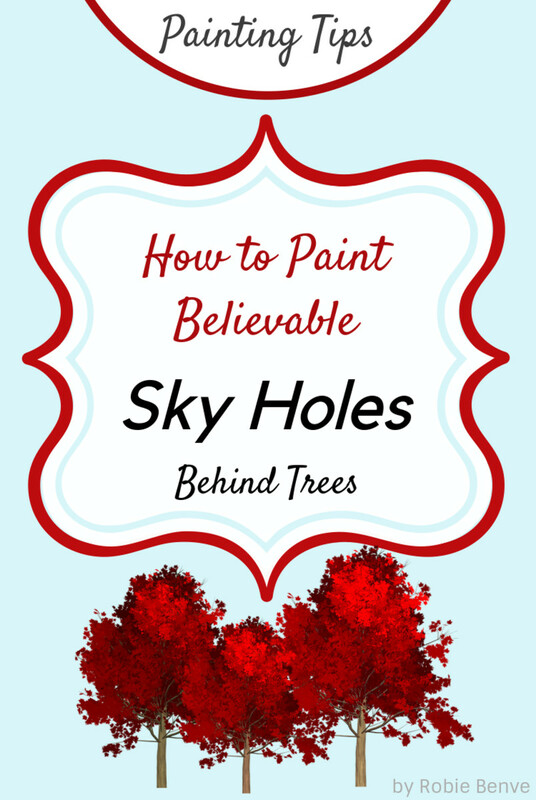 The areas between the branches where you can see the sky, often called sky holes, must be placed in relation to the shape of the tree and there are recurring patterns on how sky holes appear on trees of the same type. Observe your tree, and include only the major sky holes, those essential to understand the structure of the tree. Minor ones can be omitted. Sky holes act as details that attract the viewer attention. Use them to compose an attractive design, make sure they are varied in shape and color, and that the lead the eye where you want it to go. A sky hole next to hard wood, like a big branch or trunk, will have a harder edge and a lighter color than a sky hole next to foliage. 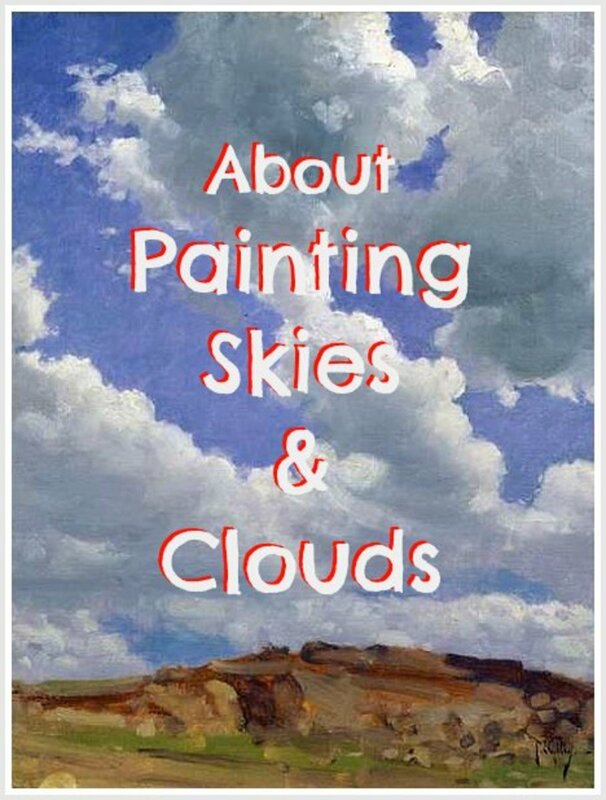 For more information about painting sky holes, see my article Tips on how to paint "Sky Holes" or sky behind trees. Typically, the closer the tree is to the foreground, the more visible the details on the trunk, foliage, and individual branches. 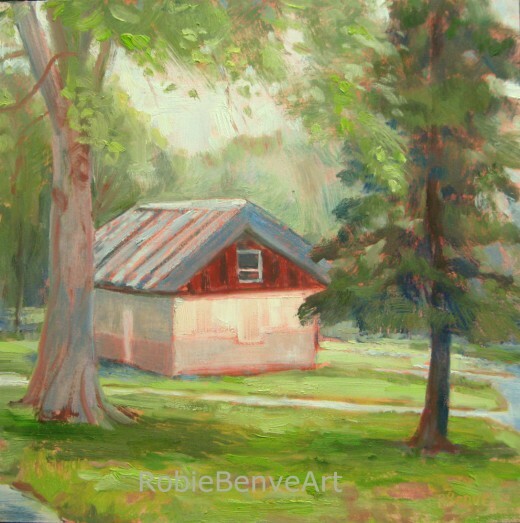 Give the foreground trees depth and dimension by creating highlights, shadows, and variances in tone and color. 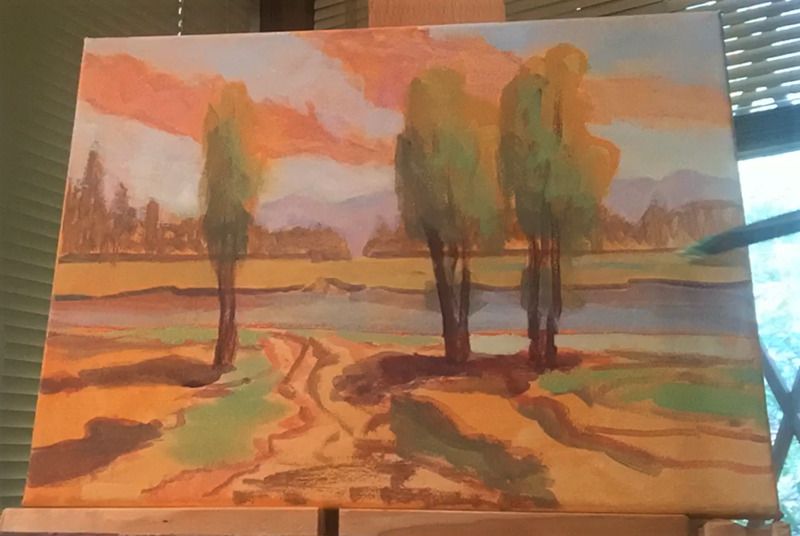 Trees in the distance should look less three-dimensional and show fewer details. The outline is the most important for a distant tree. Also, let the tree stand tall and strong against the background by lightening the background to push it back. Hey Robie, thank for your response and including the link. I'll check it out. 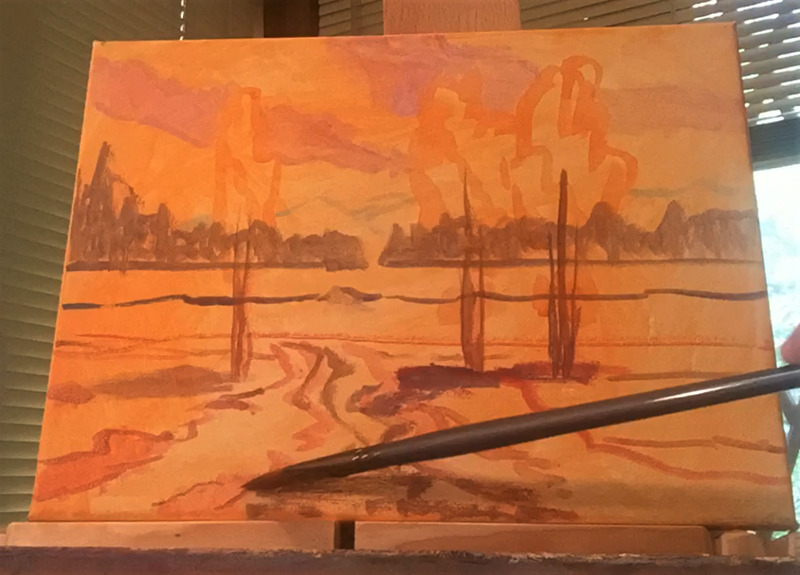 Hi Leland, the canvas on point 1 was white, I painted a warm ground color to set a nice tone for the painting. Robie- I love your art work. I was just telling a friend I'd really like to take up painting. I've dabbled in sketching for a long time, but this is really great. It's over my head, but I loved looking at your work. Was the canvas on point one pre colored or did you have to color it yourself then start painting? Hi Coolpapa, I love old, interesting-looking trees! There are several in my town, and recently the local administration has gone through the effort of certifying the oldest ones, so now they have a tag by them to let people know how old they are. The strong and convoluted branches are truly fascinating. 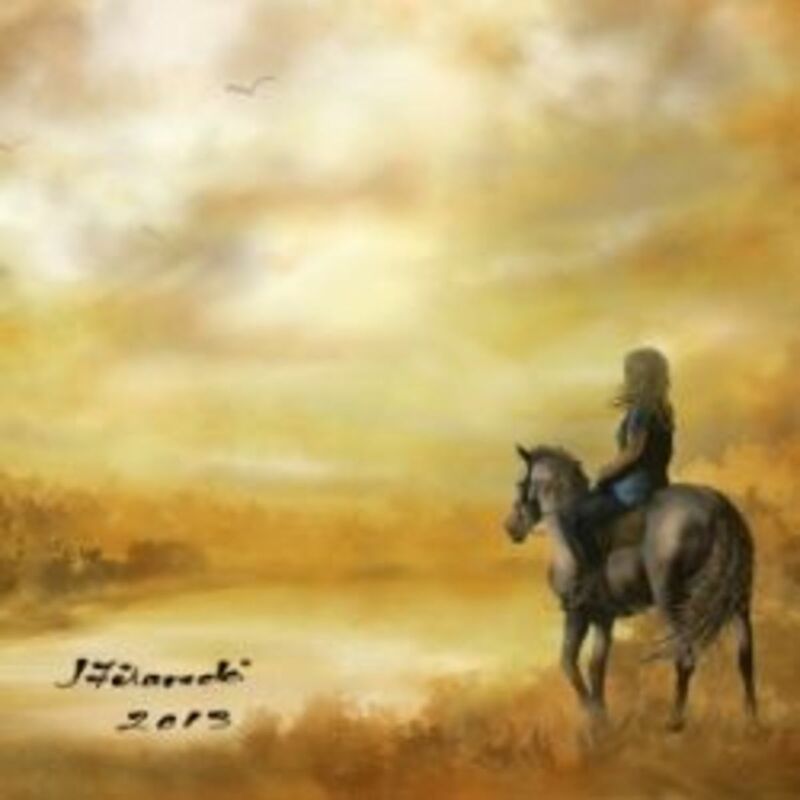 Thank you Chitrangada, wishing you much success in your future paintings and in life. Thank you Poppy, I'm very happy that you find the article useful and thanks a lot for the complements on my artwork! This is a great article, about painting the trees. I enjoy painting and Nature is my most favourite subject. Your tips and suggestions are very useful and I would be implementing some of them in my next tree painting. What beautiful pictures. You're really good at painting! Thank you for the tutorial, too; you explain it well and the pictures are good examples. 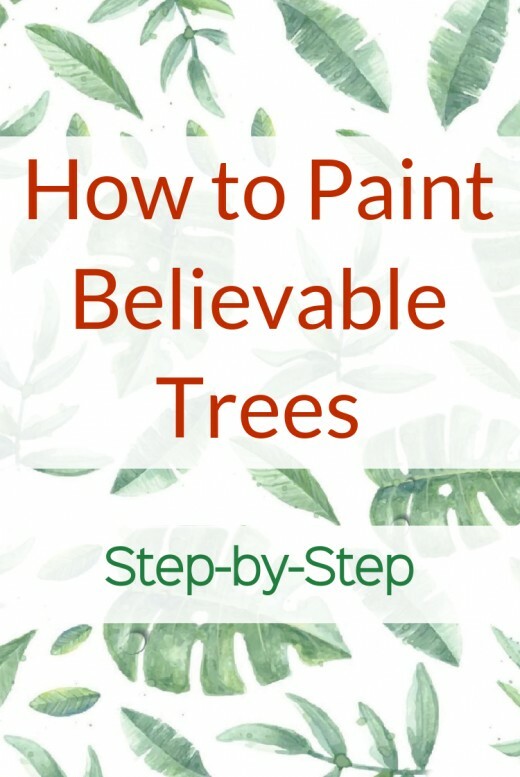 This is a great tutorial for painting trees.